Just as there is a tense to talk about the present and tenses to talk about the past, there is a special tense to refer to future events. 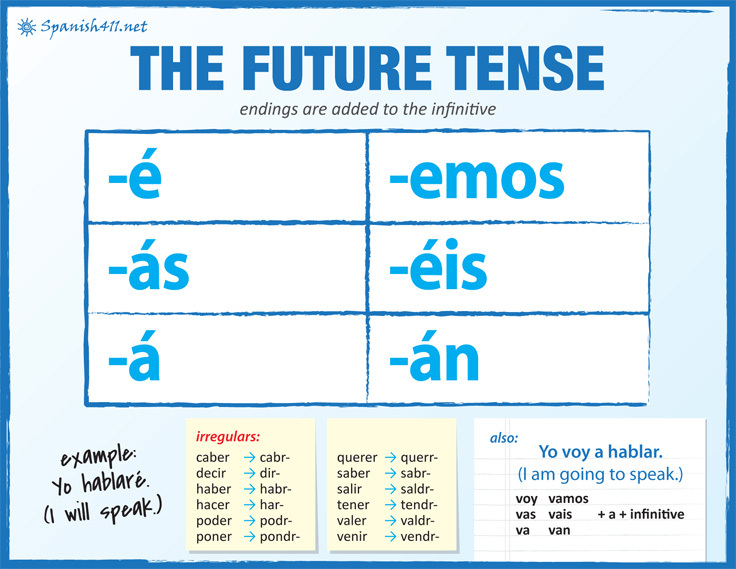 Before we discuss the future tense, let's look at a couple of ways to talk about the future without the hassle of learning new conjugations. Nosotros vamos a llamarte luego. We are going to call you later. He is going to get angry. Ellos se van la próxima semana. OK, but what if you want to speak explicitly about the future without resorting to these tricks? Use the future tense. I will work this Saturday. We'll resolve the problem tomorrow. Ellos conducirán a Chicago la próxima semana. They will drive to Chicago next week. Notice that the English translations include the word "will" (or a contraction thereof). Also, take some time to think about the pronunciation. Novices commonly ignore the accent marks and stress the second-to-last syllable. But all of those accent marks on the endings are there for a reason. They indicate that you should be stressing the last syllable (except for the nosotros form). Make sure you do so. Let's practice! Conjugate regular future tense verbs on ¡Practiquemos! Note: The verb haber is also irregular in the future. It becomes habr� which means "there will be." Note: The verb satisfacer (to satisfy) follows the pattern of hacer: satisfaré, satisfarás, etc. You knew it was coming. There are about a dozen irregular future tense verbs you should know. These verbs don't use the full infinitive but rather have shortened stems (to which we attach the regular endings). Juan Carlos no hará su tarea esta noche. Juan Carlos won't do his homework tonight. Yo te diré el chiste después del anuncio. I'll tell you the joke after the commercial. Ella querrá cenar un restaurante caro. She will want to have dinner in an expensive restaurant. Note: The verb bendecir (to bless) does not follow the pattern of decir: bendeciré, bendecirás, bendecirá, etc. La policía detendrá al ladrón. The police will arrest the thief. Los senadores propondrán cambios a la enmienda. The senators will propose changes to the amendment. Let's practice! Conjugate irregular future tense verbs on ¡Practiquemos! When should you use the future tense? If you want to talk about the future, obviously. But there are other applications as well. She's probably studying now. / She would be studying now. Where could my books be? / I wonder where my books are. No matarás. No cometerás adulterio. No robarás. You shall not kill. You shall not commit adultery. You shall not steal. Will you go the post office for me? ¿Quieres ir al correo para mí? Not: ¿Irás al correo para mí? For a presentation of the future tense, use the Verb Demonstrator.